Note the common denominator of these celebrations.... that would be the hoppy, frothy, malty beverage of Ice Cold Beer. If Mr. Fo had to choose between me and beer, it would be a tough decision, and if I'm being honest, I think beer has a pretty good shot. But let's be serious, if I had the same choice with wine instead of beer....well, let's just leave it at that. Love you honey! 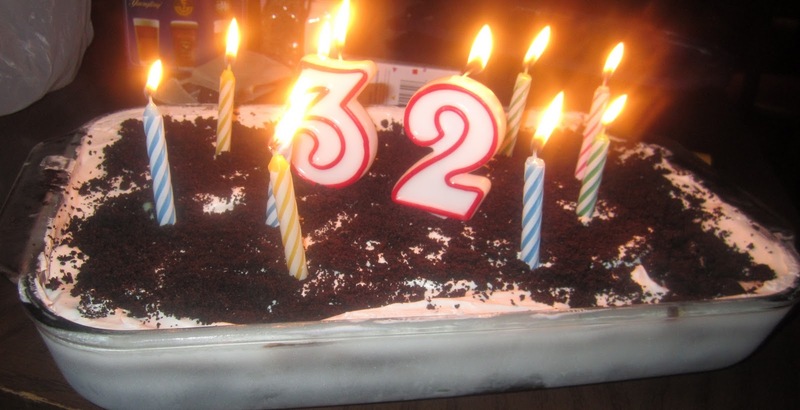 To celebrate number 32, we headed to Taco Mac. If you are unfamiliar with Taco Mac, that's unfortunate. It's the ultimate guy's place - with a million TVs and even more draft beers on tap. Check it out HERE! They even have an esteemed Brewniversity program, whereby if you drink various kinds of draft beers, you get prizes. Eventually, you get a plaque on the wall with your name. It was a proud day at the Fo house when Mr. Fo finally received his plaque. I'm sure you can relate. As a result, I have crowned him the "Taco Mac King." Let's check out his tablescape. 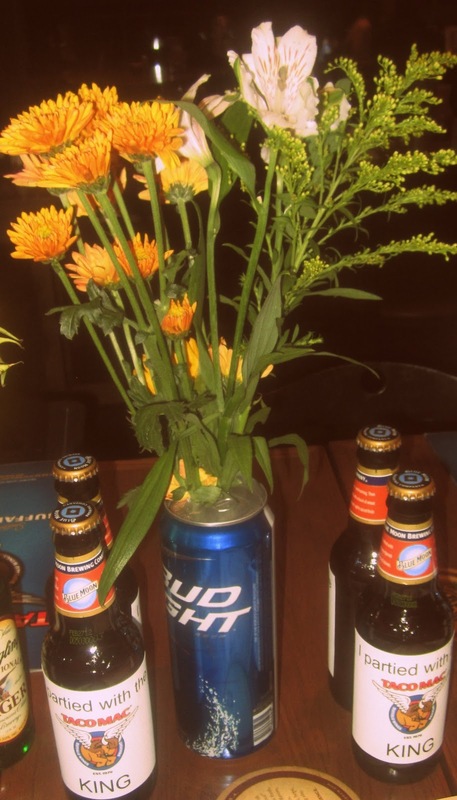 Yes, those are beer cans with flowers. See how versatile beer is? And talk about recycling! Party favors were Fall flavored Blue Moon with a custom label from the fabulous Bottle Your Brand. 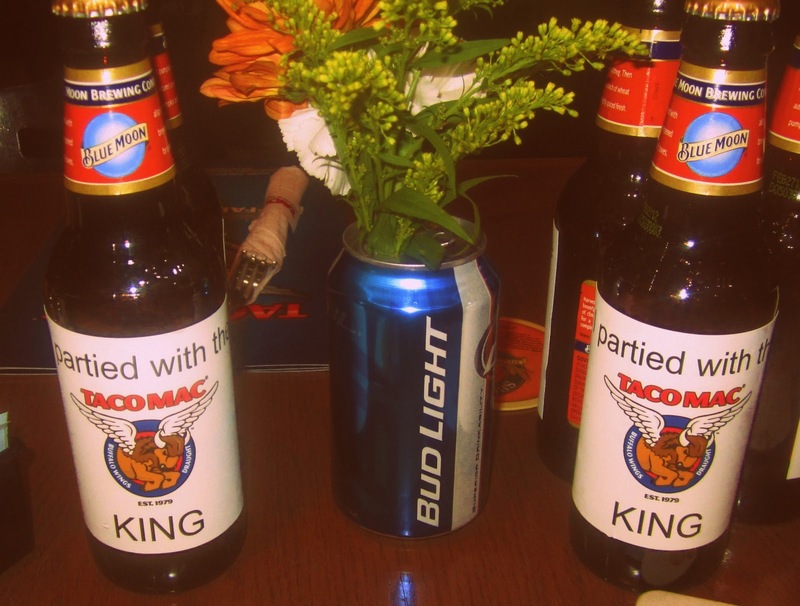 The labels said: "I partied with the Taco Mac King." I thought Mr. Fo's guests should know how important he is. I cannot say enough good things about Bottle Your Brand - the labels look fantastic and are so easy to apply! Plus they are water resistant. It's like magic. Finally, a classic birthday cake made by Mr. Fo's sister. This is the pain in the arse to make, but well worth it, Oreo Cookie Dessert. Made famous by Mr. Fo's mom, this cake is delectable. Sometimes nothing can beat a childhood favorite. We even gave some to the neighboring table since they were drooling over it. We're generous. will stewie ever friend uncle joe on fb???? The bottle centerpieces are adorable! You know you can’t put a tease out like Oreo cookie dessert and not share the recipe with us, right?! Great Fashion of women that ever liked by Me. Nice emmy. Good sharing.